It hasn’t even been a year since their debut but Pentagon is determined to make a name for themselves, this time with third mini album Ceremony. The boys first caught my eye with “Can You Feel It” and I’m eager to see what they’ll bring to the table this time. Despite their previous understated releases, they’re one of the most anticipated boy bands to debut in 2016. 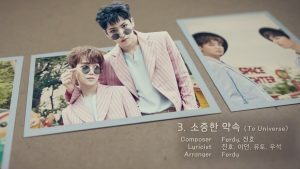 Prior to their comeback, the members have been actively making and releasing music – Jinho frequently releases covers on his Magazine Ho segment on Cube Entertainment’s YouTube channel, which sometimes features the other members, while Hui and E’Dawn joined forces with Hyuna for subunit Triple H. Moreover, Hui, together with E’Dawn and Wooseok, were also heavily involved in the creation of “Never” for Produce 101 Season 2. Clad in colorful striped suits, the boys leveraged a different kind of charisma, more towards the playful and flirtatious end. With a more mature image, the 10-membered act proves the depth of their abilities by challenging themselves with a comeback that’s a 360 spin from their previous releases. Ceremony opens with title track “Critical Beauty”, which has obvious Pharell vibes, but everything about it is refreshingly different from their previous songs. Blasting off with a funky introduction and repetitive chant of “clap your hands, everybody”, it does a remarkable job in drawing the listeners in. Drowned in playfulness, the song pulls us back to the ’50s rock-and-roll phenomenon with an Elvis Presley “Jailhouse Rock” riff, which then transitions into a hip-hop, percussion, and electro-swing fusion track. A characteristic upbeat piece, what I’m most impressed about is that it doesn’t sound like their previous song “Pretty Pretty”, which is the epitome of a typical cutesy summer bop. “Critical Beauty” allows Pentagon to spotlight their vocals, with an affluent and bold belting of high notes from Hui and Jinho. If anything, I think we all can include that Pentagon has an extremely sturdy vocal line. However, the song sounded a tad messy at first and it would have definitely taken the cake if they had followed through more with the retro-rock influence. “Lucky” joins Pentagon’s history of upbeat B-sides like “Lose Yourself” and “Stay Crazy” off Five Senses. A saccharine-induced mid-tempo pop piece, “Lucky” sets the mood just right for the remaining tracks. The chorus is exceptionally catchy, with a glut of “hey” thrown in seamlessly throughout the chorus. Its smooth, synthesized R&B sound makes it a refreshing standout and I would say that this is one of my favorites from the album. Things start to get serious with “To Universe” and just as the title depicts, it’s a heartfelt fan song for their fans. An anthem that Universes can hold close to. Members Jinho, E’Dawn, Yuto and Wooseok also contributed writing the lyrics for this track, making it even more personal and sincere. One thing I’ve noticed about Pentagon is that they are outstandingly good at ballads, just like their seniors BtoB. Hopefully, they’ll continue to release more ballads. But Yuto’s rap knocked me solid here and I’ve got to admit that their rap line is pretty promising as well. “Nothing” shows that Pentagon hasn’t lost their touch with mellow hip hop tracks. Given the mid-tempo, this song rolls a red carpet for the rappers to shine. It’s a good middleman between the funky high-spirited tracks and ballads. With a classic Pentagon sound that resonates with their previous tracks, “Nothing” could have easily doubled as a second title track. Starting off on an upbeat note, “Spectacular” is the epitome of a typical summer bop. Yet, it’s still impressively pleasant on the ears, with a catchy chorus that makes you feel like dancing along. E’Dawn’s high-pitched rapping complements the playfulness of the lyrics, which spell out the feeling of falling in love and being nervous about it. Ceremony comes to a close with ballads “Thank You” and “Beautiful”, a pre-released track produced by Ilhoon of Btob. “Thank You”, a duet between Hui and Jinho, starts off with a melancholy piano riff, slowing things down for a serene finish. The duo’s effortless harmonization is flaunted here. Yet, this ballad pales in comparison with their last track, “Beautiful”. When they released the latter a few weeks before dropping the album, I was instantly hooked onto it, especially due to the lovely gradual build-up before the emotional vocal peaks during the climax. The boys have some big shoes to fill if they want to follow the footsteps of their seniors, Highlight (formerly Beast) and BtoB. As much as I like them personally and honestly think they’re armed with so much talent, they need to work more towards establishing their own, unique style to make a name for themselves. I also wish that the album allowed the other members to shine as well because they seem pretty overshadowed by the more prominent vocalists and rappers. That said, Ceremony is a testament to Pentagon’s versatility and musical development. It does absolute justice in proving that they can tackle differing musical approaches and concepts. The attempt to shift gears gives us a tease of what’s possibly awaiting on the horizon for Pentagon and I look forward to see what they have up their sleeves in the near future.